The Sea and Shore Fine Dining Collection is a fusion of ocean elements, allowing any host or entertainer to add some nautical fun and aquatic appeal to their decor. It goes great with meals that may feature surf and turf, as well as with a variety of themes that focus on the beauty and appeal that one can find at the oceans edge or under its brilliant blue surface. This collection is home to an array of intriguing elements, ranging from big showpieces and centerpieces that are perfect for awing your guests, to little accents that are perfect for completing your tables theme. 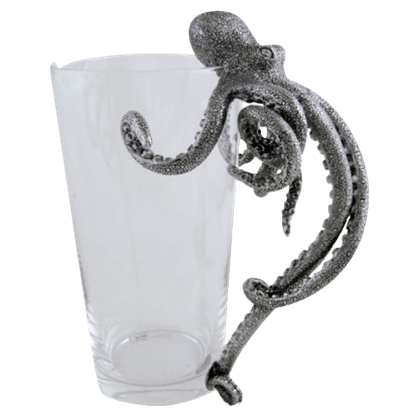 Octopuses are among the most popular decoration in this category, and you can find them all over decanters, ice bowls, serving dishes, salad bowls, dinner plates, silverware, candle holders, and more. Our octopus dinner plates and wine glasses are a perfect way to add something small to your table setting that carries through on the ocean theme. 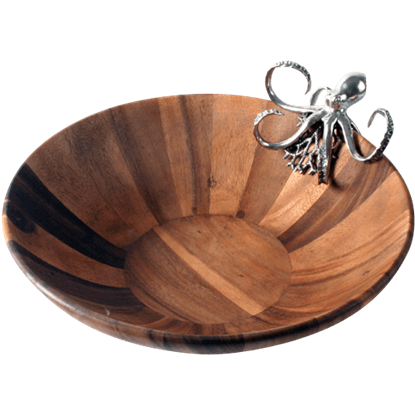 For a larger element, consider a pewter handled octopus pitcher or a clam shell bowl to serve some appetizers. 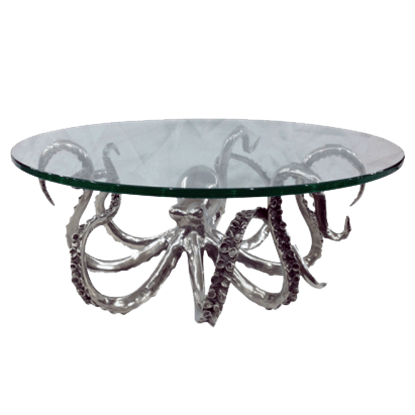 If you want to go as grand as can be, we even have big dessert stands and eight-legged octopus candleholders that will shed some light and style to your decor as well! All made from the finest glass, pewter, and wood, the elements in our Sea and Shore Collection will leave you and your guests feeling like they have just paid a visit to the seashore! A creature of mystery and myth to humankind, the octopus and other beings that live under the sea captivate the imagination. 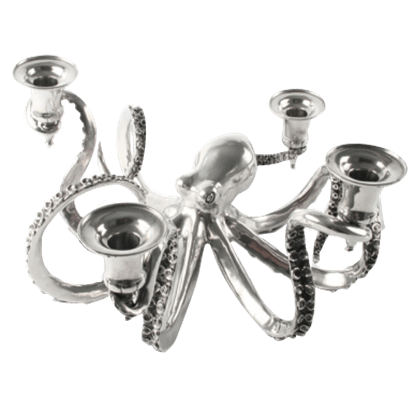 With the Four Socket Octopus Candelabrum, you can shed some light on this master of the oceans. A signature piece for your next party, the Glass Stingray Tray features four, perfectly detailed Southern Stingrays that embellish the corners. 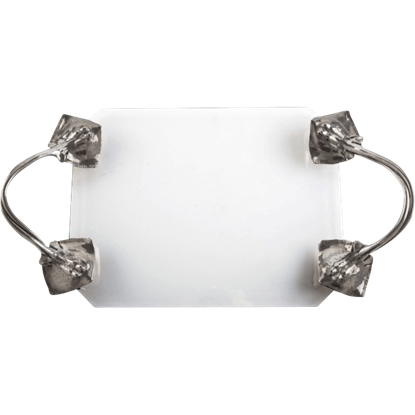 This luxury glass serving tray makes a charming addition to a marine life table setting. The sensuous waves and curves of a giant Singapore clam are reimagined in the lovely Octopus and Clam Shell Bowl. 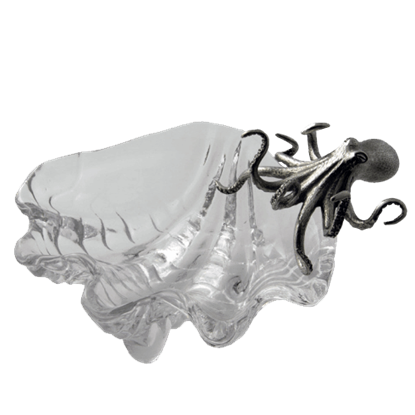 The design of this iridescent glass serving bowl is embellished with a petite pewter octopus figurine. This beautiful Large Octopus Stoneware Tray is perfect for serving a delicious meal with a nautical theme. Double glazed by hand, then twice fired to a luminous, gleaming finish, the craftsmanship of the aquatic platter is obvious. Offering up a thick, beveled-edge glass tray, the Medium Octopus Dessert Stand is ready to serve delicious sweets, creative canapes, or seafood appetizers at your upcoming dinner party while decorating your table. This charming Ocean Life Candelabrum displays innovation in a style that is as fresh as an ocean breeze. 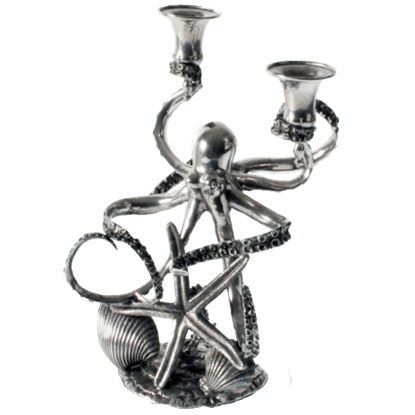 This detailed and functional aquatic creation is cast in pure pewter that gleams in the candlelight when lit. 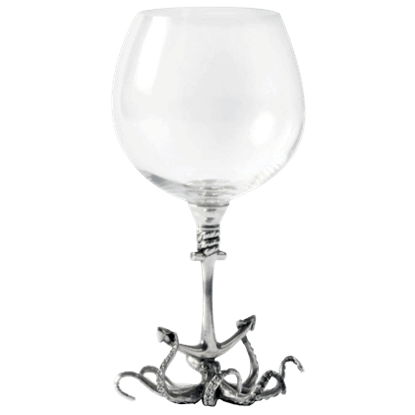 The charming design of the Octopus Burgundy Glass was inspired by a tale from 17th Century Italian folklore in which an octopus rings the church bells in order to save the village of Tellara from a pirate raid. 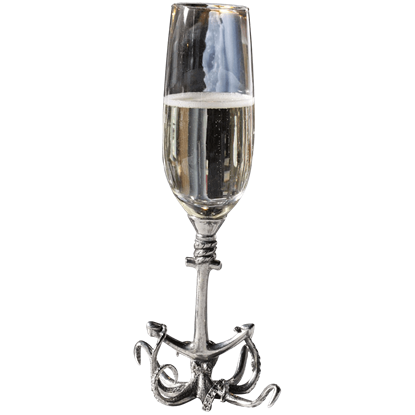 Inspired by the Italian folktale in which an octopus saves a village from marauding pirates by ringing the church bells, the Octopus Champagne Flute features an octopus lifting an anchor, creating the pewter base of the flute. Sure to start many a conversation while serving up your favorite libations, the Octopus Handle Cocktail Pitcher is an intriguing work of art. This aquatic pitcher will add charm to any gala with its intricate, kraken-inspired design. Ever a creature of mystery and myth to humankind, the ancient octopus has long inspired awe and wonder. 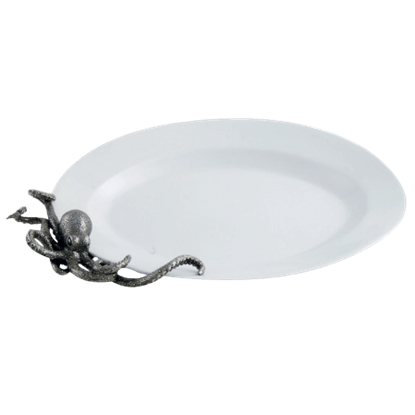 Take home a wonderful piece decorated with this mysterious creature with the Octopus Salad Serving Bowl. 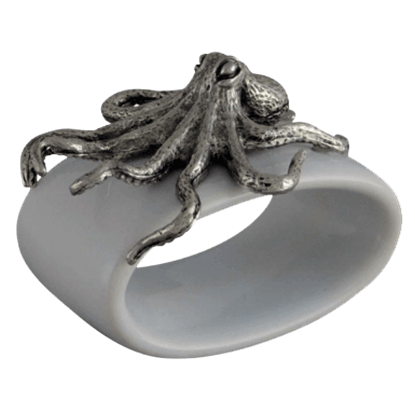 Topped by a splendid, kraken-style cephalopod finial in amazingly detailed pewter, the Octopus Stoneware Napkin Ring helps you set your table with shore side spirit at your upcoming beach house or marine-themed party. 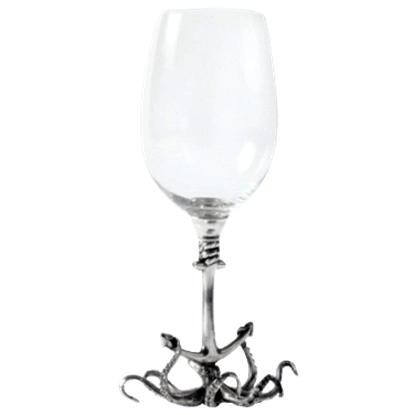 The charming design of the Octopus White Wine Glass was inspired by a tale from 17th century Italian folklore in which an octopus rings the church bells in order to save the village of Tellara from a pirate raid.